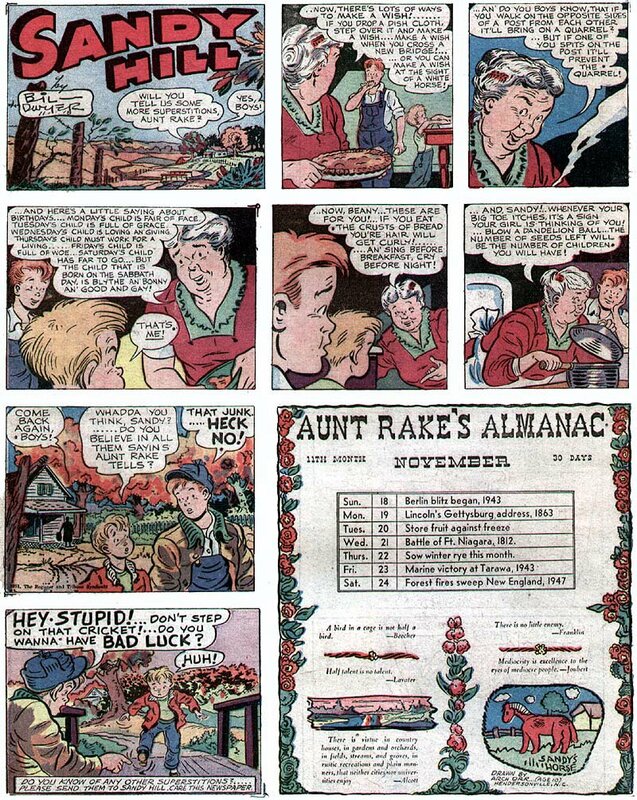 Sandy Hill, a comic strip about a country boy and his family, was the swan song for Bil Dwyer on the syndicated comics page. Dwyer was a member of the King Features bullpen in its heyday of the 1920s and 30s, assisting, retouching and occasionally ghosting Hearst strips. He got a byline starting in 1932 when he took over Dumb Dora, Chic Young's flapper strip that he abandoned to start Blondie. After Paul Fung spent two years continuing Dumb Dora he too took his leave, and the job was handed to Bil Dwyer. Dwyer continued the strip quite capably, but it was cancelled in 1936. What Bil did between Dumb Dora and Sandy Hill is a bit sketchy - I seem to recall reading about a stint in advertising comics, and he is also said to have ghosted Wally Bishop's Muggs And Skeeter during the World War II years. 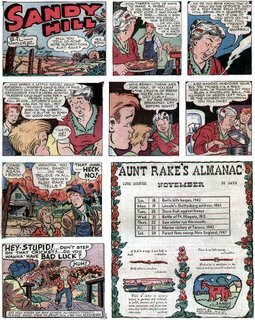 Sandy Hill, a Sunday and daily strip, debuted on January 8, 1951, from the Des Moines-based Register and Tribune Syndicate. The Sunday, which specialized in the sort of down-home material we see in this sample, caught on in a small way with some southern newspapers, but the daily is rarely seen. The strip packed it in on September 26 1954, but Dwyer must have realized that this Southern-fried material had a potentially lucrative audience. After a long time out of the spotlight, in the 1970s Dwyer started a publishing company named Merry Mountaineers that specialized in pamphlet-sized publications with titles like How Tuh Live In The Kooky South and 2001 Southern Superstitions. These publications were perennial bestsellers on the racks in souvenir shops at Appalachian and Southern tourist meccas, and must have kept the wolf from the door in Dwyer's golden years. Thanks to Ger Appeldoorn I found your blog and your comments on Bill Dwyer's "Sandy Hill." I had just run across micro copies of some of the dailies and posted a request for info on my blog (smurfswacker.blogspot.com). Your blog is incredible; I envision myself spending months browsing here.